Posted by Jon in DC, Mattel, Review with 0 comments. The Mattel DC Multiverse line is still alivein 2018! Actually, not only alive but almost going through a Renaissance of sorts. Mattel has begun upgrading the bodies of some of their figures, but in addition to that, they’ve been rebranding the look and style of their packaging. The new boxes are very nice! I think a change from time to time is a good thing, after all orange is so 2017. It’s all about the blue with the name of the ‘Collect and Connect‘ figure in the right hand corner of the box. It’s a very similar style to Marvel Legends current look, which isn’t a bad thing at all. This wave has five new figures that hold the parts to build Clayface. I’ll talk more about Clayface in a later review since he’s the main reason I bought this set. 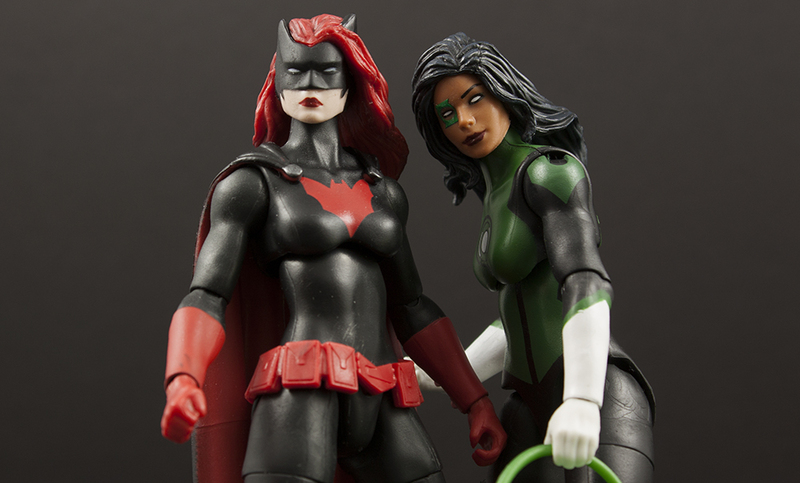 For now, let’s take a look at two figures that really stand out, Batwoman and Jessica Cruz. I think it’s a safe bet that Katherine Kane Batwoman was a very desirable choice for Mattel’s DC Multiverse line. Her costume design is gorgeous, and her figure was a great way to showcase Mattel’s new take on the female body. Kate comes packed with her alternate unmasked head as well as Clayface’s hips and head. She also has a cape, but that can’t be removed. My oh my, is it nice to have a DC Multiverse figure with a neck that has a decent range of motion! Something that I have harped on repeatedly with both the Mattel DC and Masters of the Universe Classics is that in the last few years most of these figures can barely move their heads. This could be attributed to a few things including not making the neck pin long enough, or just making the joint so tight that it feels like it’s going to break. Even with the long hair, both Batwoman and Jessica have great range of motion in their neck. In addition to that, Mattel also got the length of the neck pin just right. This way the head doesn’t rest too high or too low on the body, it’s just about perfect. While I’m very impressed with the advances in neck technology, swapping heads on Batwoman is a little bit scary. She has a LONG neck pin and the ball fits very snug into the socket. I’d maybe argue that you should never even bother swapping the masked head out because it’s perfect the way it is. The unmasked Kate Kane head isn’t my favorite thing in the world, it’s way too plain and the eyes are slightly crooked. It’s just silly to have that in place of the beautiful design work of her mask and hair. She certainly isn’t Kate, but if you want a decent looking replacement head for unmasked Batwoman, it may be worth finding either a Marvel Legends Vintage Black Widow or Mary Jane from the two-pack. The head sits on the shoulders perfectly. Jessica is one of the more recent Lanterns. Originally becoming the new Power Ring, she eventually sacrifices herself to save The Flash, destroying the evil of her inherited Ring of Volthoom. For her bravery, she is given a Green Lantern Ring, and becomes another one of Earth’s Green Lanterns. Now that we have the back story out of the way, let’s take a look at the figure. Jessica utilizes the new Mattel DC female body that includes some pretty nice quality of life improvements like new hips, double-jointed knees, wrist swivels, and increased range of motion in the neck. She comes packed with a Green Lantern, four different energy effects, and both of Clayface’s legs. Jessica’s irises disappear from her eyes when she uses her powers, which explains why they included all of the energy effect parts. I do kind of wish they had included a head with normal looking eyes, but I’m not upset about what we got. Overall, I’m quite impressed with the changes Mattel has instituted with the female body. I think they are SO very close to something great, and on par with modern Marvel Legends. Adding ankle rockers would really help with posing and just general balance, because these figures do tend to fall a lot. If they did that and worked on those elbows we would just about on par with Marvel Legends females. Would I recommend Mattel’s DC Multiverse Batwoman and Jessica Cruz? A good reason for purchasing these two figures is to complete the Clayface build-a-figure Collect and Connect. However, let’s take Clayface out of the equation. These two ladies are great! If you’ve taken a break from Mattel DC’s recent efforts, these two are absolutely worth at least coming back in to try out. They still aren’t perfect, but they are really working their way towards it. I highly recommend them both, whether you are or are not building Clayface. Batwoman and Jessica Cruz are available for purchase at Amazon.